are exposed to rosin dust and rosin ingredients in common products. There have been reports of dermatitis, irritation, and even sensitization to rosin products. Allergic contact dermatitis in violinists has been reported in the literature. It was noted by Fisher that abietic acid is the main sensitizer in rosin. A violinist with dermatitis caused by his traditional use of rosin to prepare violin bow hair tested strongly positive in allergy patch tests for abietic acid. Certain individuals tested show an allergic response to abietic acid, or hydroabietic alcohol (Abitol), or both. Violin and other string players have a lot of skin contact with rosin, through application and also while playing. Both wood rosin, which can be obtained from pine stumps, and gum rosin, which is exuded from living pine trees, contain abietic acid and its chemical relatives. Resin acids constitute about 90% of the content of rosin, and of that percentage, another 90% is abietic acid, the chemical that is implicated in most rosin- caused dermatitis. Besides skin irritation, there have been reports of respiratory irritation and even asthma in individuals exposed to rosin dust. One dancer reported to me that she had particular problems in certain dance studios that had rosin boxes in poorly ventilated rooms. Products that contain rosin and are commonly used by performing artists include: musician's rosin; rosin for toe shoes; certain adhesives and Scotch tape; brilliantine; putty and rubber; some mascara; and eye shadows and other cosmetics. Wherever a high level of rosin dust is generated, approved toxic dust masks are recommended. A rosin box for toe shoes should be kept in a room separate from the dance studio, and the area kept clean by wet-mopping and wiping as necessary. Synthetic rosin substitutes should be used by string players who are allergic to rosin. Perhaps synthetic bow hair can be developed that is textured to grip the strings without needing rosin. Unfortunately, there are presently no known substitutes for rosin. Rosin is also a problem in the visual arts. Rosin is an ingredient used in intaglio and lithography, and is present in some fluxes used in soft soldering. Respiratory irritation and asthma are health hazards that have been reported by artists doing these types of work. There is also an explosion hazard from the buildup of rosin dust around a fire or spark source. 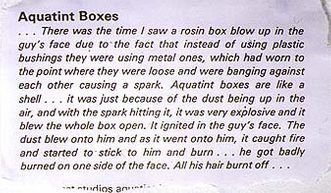 In one incident, rosin dust contained in an Aquatint box exploded from a spark generated by the electric motor used to stir up the rosin dust. Spark-proof machinery is recommended in these situations. Traditional aquatint rosin is explosive; several fires in art schools were reported as being due to Aquatint box explosions. 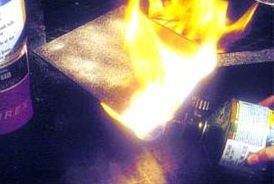 The fire hazard is often exacerbated by metal bearings in the rosin box, and the use of a naked flame for melting the rosin dust particles onto a plate. Rosin dust is allergenic, i.e. it is known to cause asthma (see PRINCETON UNIVERSITY /CAR/UIC), and is suspected of permanently clogging lung tissue. Heated rosin is also used as solder flux in the electronics industry. The fumes generated may cause bronchial inflammation. Following lawsuits, the Australian electronics industry introduced tight regulations and safety measures for the use of rosin, which is now used in fully contained working environments such as ventilated glove cabinets. Yet many art schools and print shops still practice traditional rosin based aquatint with minimal precautions. "Printsafe: A Guide to Safe, Healthy and Green Printmaking"